Truth seems to be a relative term in our world right now. Everyone has their own truth and it doesn’t necessarily agree with anyone else’s truth. 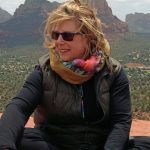 On one hand this opens the door to finding your own truth, which is a worthy pursuit and on the other hand, it creates overwhelming confusion, fear and disorientation. So how can you even trust your own truth? God has been the one eternal truth we could count on and now even that is changing. The old paradigm concept of God as the overarching male powerhouse who has control of everything is a challenging concept to hang on to in our ever changing world. If God is not male then who is God? The concept of a powerful male God is so woven into our collective psyche that dismantling it will fracture our ego structure. BUT in the end it will reveal a truth about God that is one of the deepest eternal truths our spiritual traditions have to offer. There is no separation between your consciousness and God consciousness which is infinite and all abiding. The only thing that separates you from God is your understanding of your own consciousness. This is the great mystery that mystics have come to understand through their austerities, devoted meditation practices, and isolation from the world. Now the mystery is available to be known by all, not just the mystics. The word twist is intentional. Knowing God as One Self and knowing God as one’s self are both true. With each full moon a layer of illusion is peeled back from our collective psyche. The energy of the full moon clears the palate of the mind as sorbet clears the palate between courses of a meal. If you allow it, you can sweep clean the old paradigm thoughts and feelings that hold you hostage to dis-empowering beliefs about who you are and why you are here. If you are willing to sit in the light of your deeper consciousness, which is revealed by the cycle of the ascending and descending moon cycles, the light of truth becomes a living awareness. Your Oneness and Godness self reveal. You are then capable of living as the consciousness of truth rather than having to hold on to “truth” like a security blanket. Truth is not a thing, it is a living experience of your light of being. Living in the light of truth is an experience that is self-luminous. It is an experience so profound that out of this state arise the world’s most beautiful and inspiring wisdom teachings. Instead of seeking truth as an “idea”, seek it as an experience that unfolds infinitely, forever revealing and forever empowering as the waxing and waning of the moon continues on and on. The full moon is not about lunacy. There is a deep wisdom available at the time of the full moon but it requires an intuitive awareness and resonance with the full 28 day cycle, month after month, year after year. You can’t expect to tune into just one full moon and receive the deepest gifts of lunar wisdom. With each full waxing and waning of the moon your consciousness is prepared for a spiritual maturing that only living on earth can provide. The relationship between earth and the heavens creates a sphere of consciousness in which the seed of our soul flowers. The moon is one your teachers in this sphere as is the sun, which brings us to the Sun and the Winter Solstice. Have you ever seen the meridian clock? 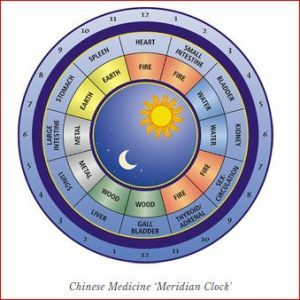 Developed in ancient times by the Chinese Qi masters, the meridian clock shows a direct correlation between our organs and the 24 hour solar cycle. In Traditional Chinese Medicine (TCM), there is an organ clock that represents the time of the day when each organ is functioning optimally and has the most energy. There are 12 organ systems and 2 accessory systems that are represented by this clock. Each organ system is also associated with an emotion, taste, sense organ, and season. TCM practitioners want to know if your sleep is interrupted repeatedly at a certain time, it will indicate which organ system is out of balance. With the epidemic of sleep deprivation in the US it would behoove us to open up to the thousands of years of TCM research to help understand the nature of sleep issues. The meridian clock which illustrates how our body is part of an intricate matrix that is so much bigger than western medicine will have you believe. Our health and well being, in fact our entire radiant consciousness, is determined by our relationship to the earth, sun, moon and the entire cosmos. The Equinoxes and Solstices are cosmic portal points that provide the solar consciousness with the opportunity to teach and guide us. With each pivotal solstice and equinox point in the earth’s annual circumnavigation of the sun, a portal opens and solar wisdom pours down upon us invisible teachings in the form of light codes. These light codes are reminiscent of hieroglyphics, they are symbols that represent a set of teachings carried on frequency waves. In order to read this code you need to align with the solar essence year after year to unveil the mysteries held by the codes. The mysteries of the cosmos are not revealed readily to the untrained student. But the fact that each person on earth is allowed, even encouraged, to be a student of the ancient wisdom is an example of the unity consciousness of the fifth dimension. The Winter Solstice is approaching quickly. The energies of the solstice are in direct contrast to the business and external focus of the holiday season. The Solstice draws us inwards while life draws us out. The Solstice drapes us in silence while the noise of the holidays drowns out the silence. It is a time when the mystics gather to meditate and open their hearts to receive the higher frequency light codes that supports the experience of truth, light and wisdom. There’s that word again, TRUTH. We circle back to the beginning in our discussion of Truth. The circle is the perfect symbol of truth. A circle holds all and everything within its sphere. At the center of the circle is a point. But the point is like a fractal. If you journey with your consciousness into the point it opens to another circle. Truth is like the point and like the circle. It is a living journey that keeps transforming us with it’s living wisdom. If you can live your life as the circle and the point, exploring the realms of consciousness as they unfold before you, you begin to live TRUTH rather than seek it. Thank you, Sarah, that indeed encapsulates it all for me…my understanding and feeling is growing.